YES! In fact, we encourage people to visit our stables. You may bring apples, carrots, and/or peppermint candy to feed the horses. There are a few rules that need to be followed for the safety of all and you must check in at the lobby of the administrative building and sign our visitor log before entering the barn area. For more information see our Visitors page. To schedule a demonstration you will need to contact the Mounted Facility at 832-394-0399, Monday through Friday, from 8 a.m. to 4 p.m. A police supervisor/officer or administrative personnel will inform you of the procedure and information required to schedule a mounted demo. As a rule, we ask that you fax or email all information pertinent to your demo request to Rebecca Dallas, or Jeff Ordon. Fax number at 832-394-0373 or email address at Rebecca.Dallas@houstonpolice.org , or Jeffrey.Ordon@houstonpolice.org. She will then contact you should additional information be needed regarding your demo request. Away demos are somewhat limited due to distance, but as a rule, we will travel anywhere in the city limits of Houston, Harris County or an adjacent county. Other demos must be approved by higher authority within the police department. Visit the Houston Police Foundation web site at www.houstonpolicefoundation.org then click on DONATE and complete the information. Please ensure that you specify your donation for Mounted Patrol. Should you have a check or cash in hand you may come by the mounted facility and drop off your donation. We will ensure that your donation reaches the Foundation in a timely manner. Should you require additional information you may ask for Officer Meredith Villarreal who has a list of needed items. We thank you for your kindness and generosity. How do I donate a horse? 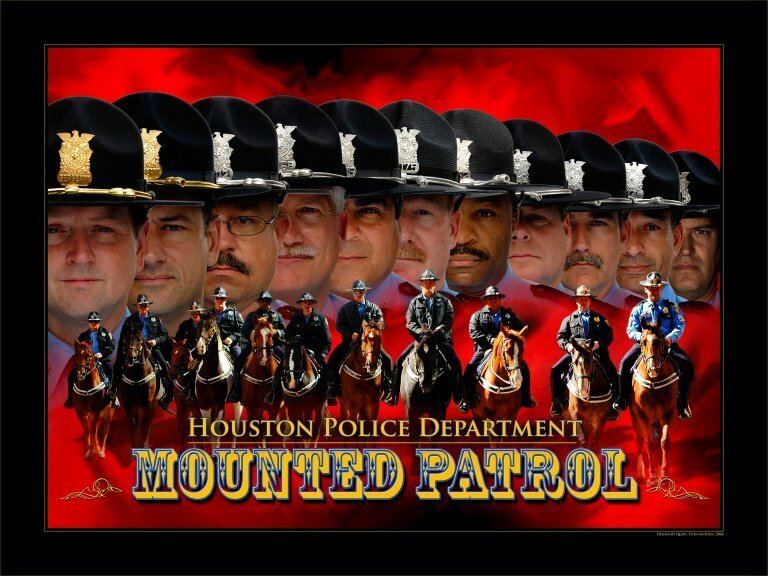 Should you wish to donate a horse to the Mounted Patrol unit please contact us at 832-394-0399 and ask for Senior Police Officer Meredith Villarreal. They can provide you with more information. Any horse under consideration must meet minimum physical standards and pass a field evaluation, a vet check, and a strenuous 90 day training evaluation. If the horse passes each one of these phases, it is then accepted into the Mounted Patrol. How do I become a volunteer at the Mounted Patrol Facility? If you have any questions contact Public Affairs at 713-308-3200 and ask for a VIP representative. Thank you for your volunteer spirit!